Skinner console in factory almost ready for reinstallation. 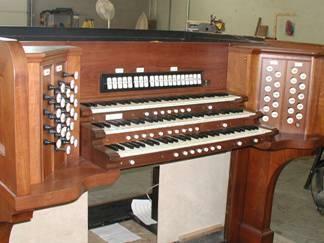 The 1925 E.M. Skinner organ in the church (Opus 521) was originally installed in Smith Music Hall on the campus of the University of Illinois. 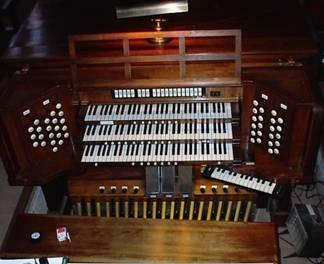 It was relocated to Wesley Church in 1965 when a new Casavant organ was installed. 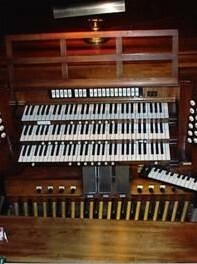 After 40 years of teaching and recital use, and another 40 years of regular service in church, it was determined that the original console mechanisms could not be cost-effectively restored. The console was removed to our factory for renovation. The console cabinet and bench was repaired, re-glued as required, and refinished consistent with the original work. The electronic chime equipment was removed from the console. A lock was fitted in the roll top in the original location of a lock. The manual keyboards were cleaned, repaired, and bushings were adjusted. New contact assemblies were fitted and wired for the keyboards. The pedal board was cleaned, re-bushed and equipped with a new contact assembly. The expression and crescendo shoes were cleaned and fitted with new contact assemblies. The existing reversible spoons were re-plated to restore their original appearance. Two new toe pistons were installed that exactly match the appearance of the existing originals, increasing the number of general pistons. The console mechanisms were replaced with modern components in a way that preserves the original appearance of the console. Modern solid state switching was installed in the console and in the chamber. A modern, solid state multi-level combination action, new electric action draw knob solenoids and tilting tablet movements were installed in the console, preserving the original ivory knobs and tablets. Additional blank drawknobs were installed to allow for possible future additions to the instrument. The solid state switching utilizes multiplex technology, allowing for the installation of MIDI in/out circuitry and a sequencer for record-playback equipment. Controls for MIDI on Great and MIDI on Swell will be by new thumb pistons. Other MIDI controls were installed in a sliding drawer under one of the stop jambs, as was the control panel for the combination action. 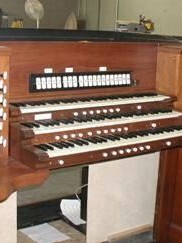 A new, custom designed and built solid state relay was installed in the console and organ chambers to handle all switching functions in the instrument. New DC power supplies were installed in the console and organ chambers. The rebuilt console was returned to the church. New, color-coded, pvc-insulated wire was installed throughout the organ. New cabling was run from the console to the new relay panels installed in the two chambers, and from the relay panels to the wind chests. Sufficient cable was supplied to allow the console to be moved to any point within the chancel, should the console eventually be made moveable. All original E.M. Skinner components that were removed from the instrument were carefully labeled, boxed, and stored in the organ chambers.